To maximize the probability of detecting metal contaminants in high-value foods, in particular confectionery and low-side profile products, Fortress Technology is unveiling a multi-orientation, multi-scan food metal detector. The Interceptor DF (Divergent Field) can be customized to different aperture sizes depending on the products being inspected and offers detection performance levels that outperform any current technology, including X-ray. It is especially sensitive to very thin contaminants that are difficult to detect and can be missed by other technologies. Critically, this newest approach to food metal inspection addresses several previous limitations - notably orientation, size, geometry, and position of metals, especially ultra-thin contaminants. 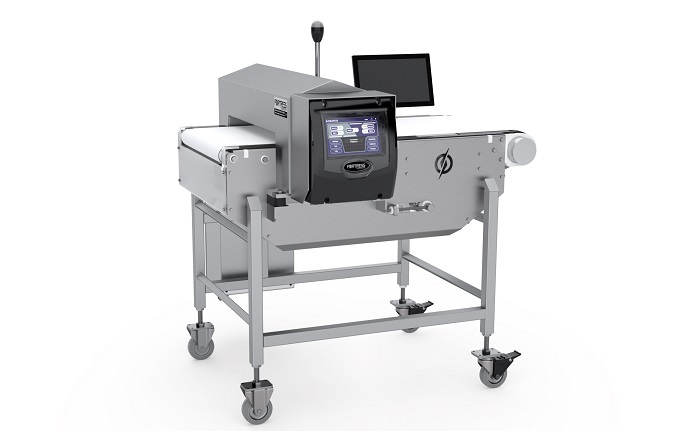 Unlike other multi-scan food systems that scan a select number of frequencies, the Interceptor DF uses multiple field patterns to inspect products both horizontally and vertically simultaneously as they that pass through the detector. As a result, this system reports a 100 percent increase in sensitivity compared to single- or dual-frequency food metal detectors and a high level of improvement to identifying and rejecting contaminants that are non-spherical. Typically, foods with a low side profile (i.e. chocolate, confectionery, nutrition bars, cookies, and biscuits) undergo a number of manufacturing processes, including mixing, cinching, rolling, scoring, and moulding. The use of automated equipment to perform these tasks can make them more susceptible to smaller flake and shaving-shaped metal contaminants. As well as dry products, the Interceptor can also be used to inspect small thin packages of conductive products like cheese and deli-meats. Typically, all of these products have a high value and high market image. The Fortress system has multiple electromagnetic fields that are orientated in different directions. In essence, it’s like running multiple metal detectors all at once. Rather than missing a metal contaminant because it hasn’t aligned with a specific frequency, the Interceptor DF looks for signals over a broad spectrum, from multiple angles. This increases the probability of finding a small swarf, shaving or flake of metal, regardless of the orientation. For fast set up and ease of use across mixed product lines, the Interceptor DF learns and recalls the signature of any given product with just one pass. Halo automatic testing can be added to reduce the risk of human error when manually testing the performance of the detection system. To increase supply chain transparency and product traceability, automatic product tracking and data capture software is included as standard. Although more expensive than a ‘regular’ food metal detector, it’s still only about 25% of the costs of a new X-ray system yet performs better and is more reliable at picking out metal of all types and sizes.